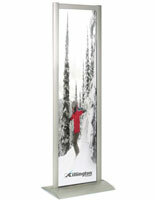 Eight Foot Tall Display Stands! Contemporary Design at a Bargain Price! 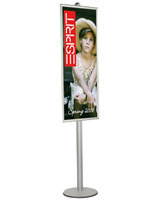 These display stands offer double sided viewing! 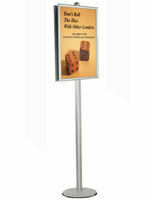 These Display stands, sign holders, have a new, sophisticated look. 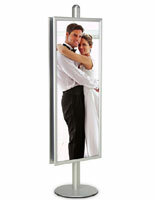 These display stands are built from sturdy, durable aluminum frames. 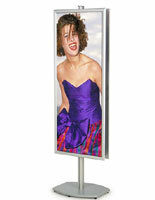 The sign stands have two snap open frames fitted back to back for maximum ad exposure. 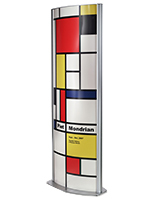 Place these graphic stands in any large indoor venues like convention halls, lobbies, trade show booths or retail stores. 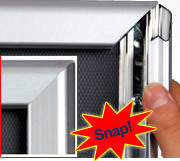 The snap open frames are made for easy and quick graphic loading. 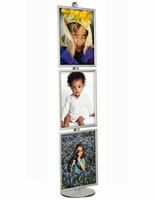 Simply lift open all four frame sides, insert the graphic or sign, and snap the sides down. Non-glare clear PVC plastic lenses are included to reduce glare and protect the contents. Frame installation and height adjustments are easily performed using the screws on the connector plates behind the snap frames. 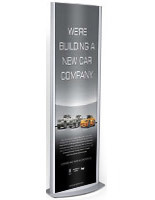 These tall display stands ship unassembled and go up quickly with the installation instructions provided.